GAYLORD, MI -- In 1981, Keith Gornick was sent up to Gaylord for six months by his father, Alan Gornick. The senior Gornick had instructed the younger to prepare the family's resort - The Otsego Club - for sale. Today, Keith Gornick gazes out the resort's picture windows over the Sturgeon River valley, raises his glass in a silent toast to his late father, and beams: "It's been a long six months." In these "long six months," Keith Gornick has engineered an impressive expansion at The Otsego Club, which is one of the cornerstones of the internationally acclaimed Gaylord Golf Mecca. The resort is still the only private ski club in America, but the golf is wide open to the public. Wide open, indeed. The newly-opened fourth course on the property, The Tribute, is routed through 1,100 acres of dense forest, pristine wetlands, and vertiginous elevation changes. That's right: The Tribute occupies nearly 1,000 more acres than the average golf course. And when course architects Gary Koch (TV golf analyst and PGA Tour Player) and Rick Robbins first walked the land, they felt like kids in a candy store. "This is the best site we've ever worked with," admits Robbins. "And the wetlands," Koch adds, "are like nothing we'd seen before. Holes 5, 6, 7, and 8 are all down along the Sturgeon River bed." Indeed, the wetlands and Gornick's deeply held commitment to the God-given beauty of the land demanded incredible diligence and planning. From beginning to end, the course took eight years to build. Robbins marvels when he looks back at the process: "Just delineating the wetlands took two years." Gornick allowed Koch and Robbins a lot of latitude in choosing the best spots for golf holes on the massive property. "We didn't have to move a lot of dirt," notes Koch. "We were able to pick and choose the best spots for golf holes." Still, there were so many great spots it was almost an embarrassment of riches. The Robbins-Koch Golf Design firm produced 20-25 routings before finally settling on one. 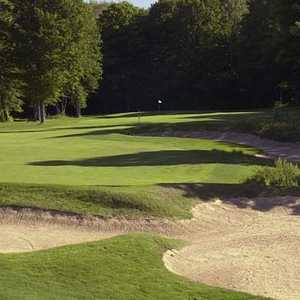 Given the high-profile course architects, the tradition of world-class golf in Gaylord as a whole and The Otsego Club in particular, and the breath-taking acreage, expectations for The Tribute were high - very, very high. By all counts, those expectations have been met and surpassed. Sports Illustrated has just named The Tribute to its list of "Top Ten New Public Courses" (No. 7). And Microsoft has chosen it as one of six courses world-wide to be included on the company's next incarnation of the popular Links computer game. The real test, however, comes from the architects themselves. Are Koch and Robbins satisfied? Gary Koch smiles: "Rick and I are very pleased with the results. The ideas and plans have come to fruition. It's a wonderful combination of beauty and a solid golf course. And I believe these are the finest set of greens that Rick and I have ever done"
Robbins agrees, in his homey, Southern twang: "Every golf course you build is like your child. This golf course will be here longer than I will, so you want it right. Every course needs some tweaking, but I think there's very little to tweak here." Just like you can't ask a parent to choose a favorite child, it's tough for course architects to pick their favorite holes. Gary Koch suffers the foolish question politely, though, and with a good natured grin, admits, "If I had to choose, I would say the view from the tees of No. 3. And the stretch of holes along the Sturgeon River bed." More than any one hole though, it is the classic, subtle design features set off against the magnificent northwoods topography that both architects and true golf aficionados find most admirable about the design. From the six or seven different varieties of turf grass used ("One of the most complex grassing plans we've ever done," reports Robbins) to the elevation changes from tee to green, ranging up to 140 feet, the sweeping vistas tend to distract players from the attention to detail. Nearly every tee is elevated, with Nos. 3, 6, 11, 14, 16, and 18 as the most stunning. From the tees of the 430-yard par-4 3rd, players can see the northern horizon over thirty miles away. And from there, the hole plays downhill all the way to the green, resembling the ski slopes running practically side-by-side with the fairways. Notably, the vistas from the more forward tees are just as nice as from the tips, so mere mortal golfers can enjoy the divine scenery, too. The greens complexes are spectacular throughout the design - huge, undulating greens, many of which actually look smaller than they are due to their elevation and the grandeur of the surrounding countryside. "The course is very playable for the average resort-course player," maintains Koch. "There is almost always a run-up ramp to each green, and one side that you can miss on." And despite all the undulation, the size of the greens allows for numerous fair, level pin locations. Long carries off the tee are also generally avoided, assuming golfers play from the right tees for their skill level. From 7,347 yards at the tips to 5,085 yards at the forward tees, the four sets of tee stations suit nearly everyone. A couple of exceptions to this rule are evident, however. The tees on No. 16 (545 yards) appear to be a mile from the fairway, though Koch admits incorporating several visual illusions into the design. Yardages can be hard to gauge the first time out. Some fairways are much closer than they appear, such as No. 11 (551 yards), where you simply won't believe that your drive can pretty easily clear the bunkers in the middle of the fairway and careen all the way into the rough on the other side. The 9th is an incredibly testing par 3 from the tips, at 240 yards, but much more manageable from the back (214 yards) or middle (202 yards) tees. Here, the two swaths of marsh between the tees and the green make you feel like the hole is even further away. Players tend to forget the safe bailout area to the front left of the green, from which it is rather easy to get up and down. Finally, a truly admirable feature of the layout is the views from the greens themselves the fairways, which are nearly as spectacular as the views from the elevated tees. From the greens, most of the numerous bunkers are invisible (an Alister Mackenzie hallmark), and most of the seven-mile long cart path is also hidden from view. As per Keith Gornick's instructions, Koch and Robbins have preserved the land for the most part just as God made it. During the construction of the course, Keith Gornick and Gary Koch both lost their fathers. At that point, the course was christened "The Tribute" in honor of both men, as well as the love for the land and for the game that they had imparted to their sons. 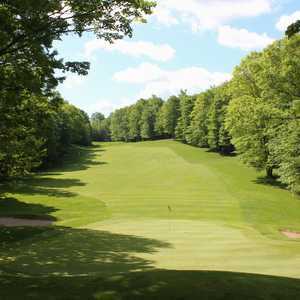 But the course has become a tribute to more than the two fathers; it is a tribute to the son who saved the property in 1981, the skill of the course designers, and the natural wonders of the Great Lakes region. The Tribute is a worthy addition to a locale where top-flight championship courses are plentiful. Moreover, its construction effectively preserves the beauty of the land, protecting it against subdivision or clear-cutting. Keith Gornick raises his glass again towards the window: "We've done something here that will be enjoyed by generations to come." And as he says this, you feel certain that it is being enjoyed by generations past, as well. 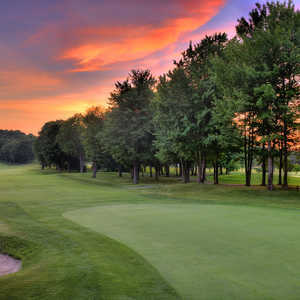 I HAVE PLAYED GOLF COURSES ALL ARROUND THE MIDWEST. THE TRIBUTE AND BLACK FOREST ARE THE ARE THE FINEST COURSES I HAVE PLAYED. THESE COURSES ARE WORLD CLASS.THESE ARE MUST PLAY COURSES.